The stained glass windows of the Cathedral were made in Birmingham, England at the famous Hardman Studios and were brought to Australia in the late 1880’s. This magnificent Great North Window (above) is a beautiful depiction of the Coronation of Our Lady in Heaven with Christ present. At the foot of the throne and surrounding it is the celestial choir, winged and robed in blue (The Blessed Virgin’s colour) singing and playing musical instruments. To the left of Mary are figures of the virgins and holy women of the New Testament, a symbol of Mary’s Virginity. To the right of Our Divine Lord are figures of male saints who by their writings, teachings and by love and devotion advanced, defended and honoured the name of Mary. 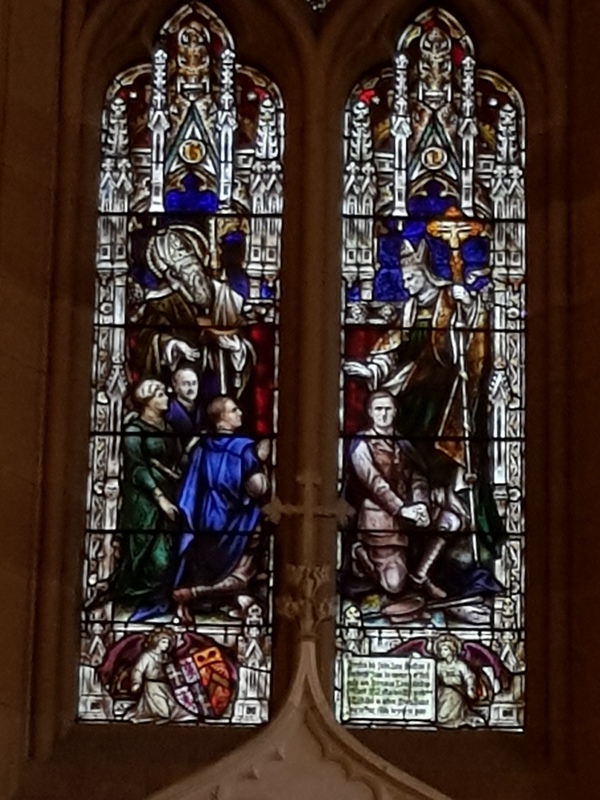 This window symbolises that the Blessed Virgin, by her humility, obedience and ready co-operation in the work of Redemption by the Son of God, obtains for us a reversal of the consequences of Original Sin.